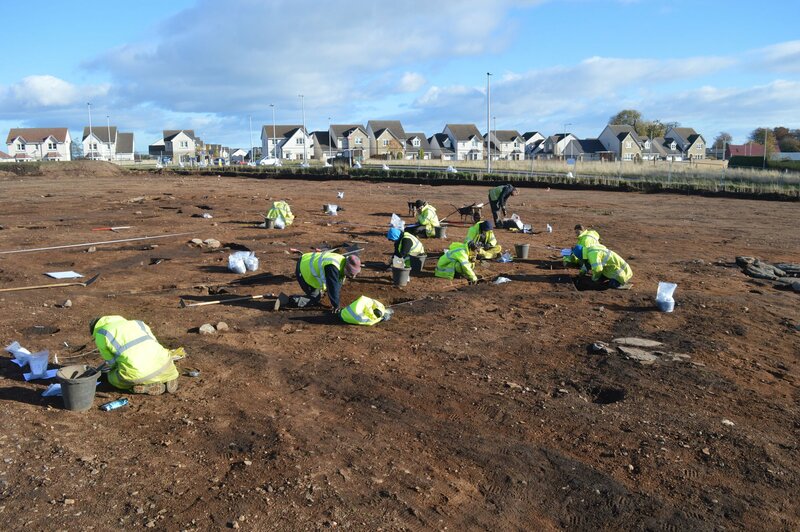 Archaeologists have discovered a hoard of Bronze Age weapons of international significance in Carnoustie, Angus, eastern Scotland. The property at Newton Farm was bought by the Angus Council last year with the stipulation that it be dedicated to community use. Because an earlier dig in the area in 2004 had found evidence of extensive prehistoric and medieval remains, the council also had to ensure the site was excavated to recover any archaeological remains before construction. GUARD Archaeology were contracted to excavate the site. In a shallow pit, the team unearthed a bronze spearhead next to a bronze sword, a pin and scabbard fittings. Decorated with gold ornamentation, the bronze spearhead is an incredibly rare object. Only a handful of Bronze Age spears of this type have been found in Britain and Ireland. One of them was discovered in a weapons hoard in 1963 at a farm just miles away from Carnoustie, so that means that out of the few gold-decorated bronze spearheads known, two of them were found in Angus. This suggests the area had a significant a wealthy warrior class around 1000 B.C. Since the bronze weapons are around 3,000 years old, the metalwork is very fragile. To ensure these delicate artifacts could be excavated with all necessary caution in a protected environment, the soil surrounding the pit was cut out and the entire 175-pound block was removed to the GUARD Archaeology Finds Lab. There conservators analyzed the block to develop an excavation plan that would safely preserve the finds. The en bloc excavation proved even wiser when organic remains were found in the hoard. The leather and wood scabbard, while broken into several fragments, is the best preserved Bronze Age scabbard ever discovered in Britain. Textile fragments were found around the pin and scabbard; fur around the spearhead. These kinds of materials almost never survive outside of waterlogged or arid environments. Another great archaeological boon to this hoard is that it was unearthed within the confines of a Late Bronze Age settlement. It’s not isolated on the edge of a ploughed field where all we can find about the hoard’s history is in the hoard itself. It’s part of a much wider context. The team unearthed the remains of around 12 roundhouses, probably from the Bronze Age, and other large pits holding what appears to be refuse (broken pottery, lithics). About 650 artifacts were discovered from the Bronze Age settlement. Most of the finds give a date range of between 2200 and 800 B.C. for the Bronze Age occupation of the site. There were people living there long before the Bronze Age, though. 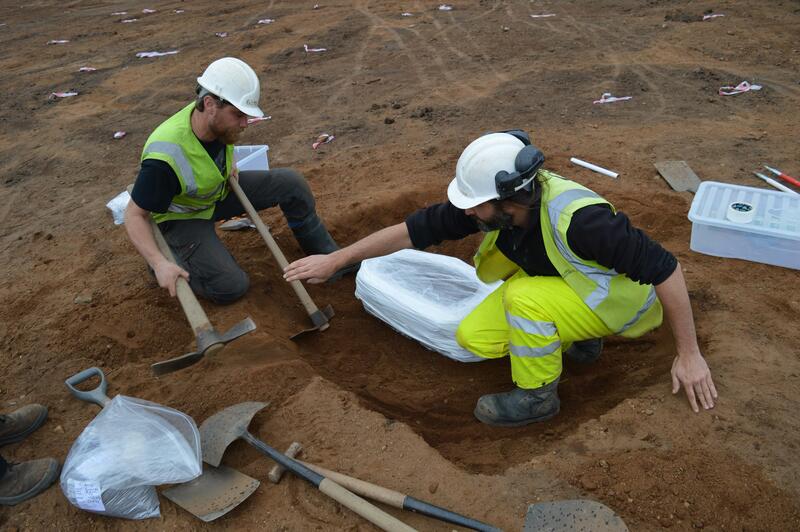 Archaeologists found the remains of two rectilinear structures dating to the Neolithic. The oldest dates to around 4000 B.C., and it too is a testament to the area’s prehistoric prominence. It’s the largest Neolithic hall ever found in Scotland. There is no clear evidence of continuous occupation, so the site could have been inhabited from the Stone Age through the Late Bronze Age, or successive settlements could have been built on the site with gaps of centuries between them. The site is slated to be converted into two grass soccer fields, as per the community use requirement, and construction will begin at the end of the month. The excavation of the larger site will continue.